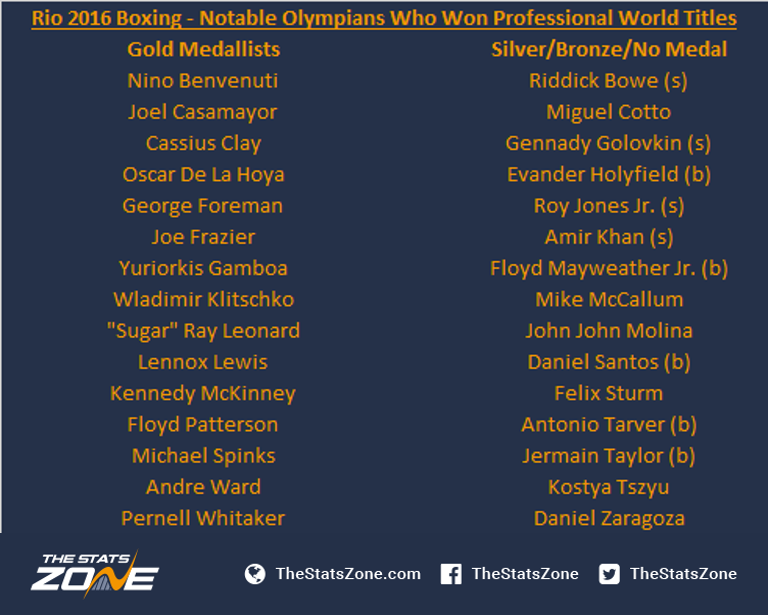 Is Olympic Gold A Precursor To Becoming A Professional Boxing World Champion? With the 2016 Olympics now underway in Rio, we have taken a particular interest in the boxing ring. Some of those competing for gold will never venture away from the amateur game, but for those who do choose to turn professional, what are the chances of them achieving the ultimate prize of becoming a world champion? TSZ takes a brief look. When looking at the number of Olympians who have turned professional, it’s an extremely impressive list. From Michael Spinks to “Sugar” Ray Leonard, Joe Frazier to Oscar De La Hoy and Lennox Lewis to George Foreman. Below is a list of notable Olympians who turned pro with varying success from their amateur days. Oscar De La Hoya (39-6) – De La Hoya won Olympic gold in the lightweight division in 1992. It didn’t take him long to win his first professional world title, with that coming just two years later. He won the WBO World Super Featherweight title before becoming WBO World Lightweight champion in the same year. By the time he retired in 2009, De La Hoya had won 10 world titles across six different weights. “Sugar” Ray Leonard (36-3-1) – “Sugar” Ray was Olympic champion in 1976 having won the light-welterweight division. Having won world titles at welterweight, light middleweight, middleweight, super middleweight and light heavyweight, he is regarded as one of the greatest boxers of all time, with his world titles coming at weights between 147lbs and 175lbs. Floyd Mayweather Jr. (49-0) – Mayweather Jr. claims to be the greatest boxer of all time but one title that eluded him was an Olympic gold. Having taken just a bronze from the 1996 Olympic featherweight division, “Money” retired with an unbeaten record in the pro ranks, having won world titles across five divisions. Kostya Tszyu (31-2) – Despite amassing an amateur record of 259-11, Tszyu failed to win a medal at the 1988 Olympics. Having turned professional, he managed to forge a very good career in the light-welterweight division. He ended his career as a two-time world champion and also unified the division from 2001 to 2003, which had not been done for 30 years at light-welterweight. Looking at some of the names who failed to win gold or even medal at the Olympics, it suggests it isn’t a precursor for professional success. Gennady Golovkin is now arguably the most feared man in boxing with a 35-0 record, with 32 of those wins coming by KO. He didn’t win Olympic gold, with his silver medal coming in 2004 having lost out to Gaydarbek Gaydarbekov at middleweight, the division that GGG now dominates in the professional ranks. There could perhaps be more success from Olympians at professional level if more chose to leave the amateur ranks. Félix Savón, Teófilo Stevenson and László Papp all won three Olympic golds but only Papp turned pro. Despite political problems affecting where he could fight, Papp went undefeated throughout his professional career (27-0-2) and it is thought he would have won a world title had he been allowed to fight for one. Another man who turned professional following Olympic gold is Luke Campbell, who ended his glittering amateur career with an Olympic gold medal in his home country in 2012. The Hull-born boxer is Britain’s most decorated amateur of all-time, collecting a European Championship gold in 2008 as well as a silver medal at the 2011 World Championships. Campbell’s first professional fight came in 2013, and he’s currently sitting on a record of 14-1 having beaten former world champion Argenis Mendis on 30th July. This was billed as a big fight for Campbell on his quest for a world title shot, with him potentially primed to become the next Olympic gold medallist to achieve world champion status in the professional ranks. Campbell’s teammate and friend Anthony Joshua has already achieved this, having won IBF World Heavyweight title earlier in 2016. If Campbell is to go on to win a world title of his own, do the numbers stack up for him? Since boxing became an Olympic sport in 1904, there have been 237 gold medals awarded to men in the sport of boxing. Of those 237, there were 219 different winners. At the time of writing there have been 41 world champions in the professional ranks from those who won Olympic gold. This equates to a success rate of 18.72% of Olympic champions becoming professional world champions. It may not appear a great ratio, but as highlighted earlier in the piece, not all Olympians turn professional. To those who don’t win gold – or any medal for that matter – in Rio and want to turn professional, it also doesn’t mean you cannot achieve anything, as boxers such as Floyd Mayweather Jr. can testify.